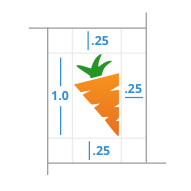 Please do not call us: investor carrot, agent carrot, on carrot, OnCarrot, or any other variation. Currently, Carrot has two product offerings. Please refer to these products with the specific spelling (no space between Investor/Agent & Carrot). When displaying a Carrot logo, leave at least 1/4 the height of the logo as margin between other text and borders on all sides of the logo. When displaying the Carrot mark, leave at least 1/4 the height of the logo as margin between other text and borders on all sides of the logo. Note: Do not add to, rotate, recolor, or otherwise modify the Carrot logos. The white logos can be displayed on colored backgrounds. Please use brand primary and secondary colors as backgrounds whenever possible.